As lawyers figure out where Citizens of the World Mar Vista decides will call home in the 2014-2015 school year, LA Unified board member Steve Zimmer says the charter is likely to encounter the same friction it endured as a co-located school this year at Stoner Elementary if it remains on LA’s west side. (See story here). Much of it has to do with the shortage of land and property values that shut out more people as housing prices increase. Zimmer, whose district covers much of LA’s coastal neighborhoods, has been a steady critic of co-locations, a phenomenon that grew out of Prop 39, a voter initiative approved in 2000 that established the practice of making under-used space in a public school available to a charter. Last fall, he introduced a board resolution, asking state lawmakers to draft more clearly-defined guidelines for applying the law so that the host school is not penalized for sharing its space. In west side areas like Del Rey, Westchester and Venice, where other co-location disputes have broken out, the demographics of homeowners has changed much faster than the local school populations, generally shifting from a mix of African-American and white to larger numbers of white homeowners. A plan to add middle school students at Goethe International Charter on the Marina Del Rey Middle School campus was denied in 2010 by Superintendent John Deasy and the school board because of a lack of diversity among its students. In 2012, Ocean Charter School wanted to build a new facility on two acres of unoccupied land at Walgrove Elementary in Mar Vista, but after intense protests by parents, the school board voted against the project. Parents at Westminster Avenue Elementary blocked the co-location of Green Dot’s Westside Animo Middle School. The charter was subsequently assigned classroom space at Cowan Elementary in Westchester, where it faced no opposition, evidence that co-location is not always acrimonious. Instead, he says, they exercise their right to start their own charter schools or they send their children to private schools. Charter school opponents contend that the growth of charters arising out of market-driven segregation inherently sets up a contentious dynamic between the public school families and those attending charter schools. A recent UCLA study analyzing segregation in California public schools found that in the 2012-2013 school year in LA Unified, almost twice as many Latino and black students, 89.9 percent and 86 percent respectively, attend a low-income school as their white counterparts, at 48.3 percent. That dichotomy played out this year at Stoner. Disputes over traffic congestion, parking and resource sharing drove a wedge between Stoner parents and local residents and CWC parents, leading to sometimes ugly confrontations and giving anti-charter and anti-co-location forces new evidence for their cause. At Stoner, whose 811 API score is above the state standard, there is a “minuscule difference” in the demographics of the student population between now and last year, before the co-location with CWC, according to Stoner’s principal, James Stapleton. In 2012-13, Stoner was 91 percent Hispanic, 6 percent African-American, 2 percent white and 1 percent Asian/Pacific Islander. But the composition of the CWC student body is 47 percent white, 27 percent Latino, 14 percent Asian/Pacific Islander, 8 percent African-American, 4 percent identifying as “other” — a breakdown that suggests white parents are more comfortable sending their children to a charter. CWC literature also cites studies showing that students who form meaningful relationships with people of other races and cultures are better able to live and work in diverse settings later in life than those from more homogenous schools. While no one has argued against this philosophy, anti-charter groups insist that traditional public schools would not be so homogenous — with overly large majorities of brown and black students — if white middle class students weren’t fleeing the system. Parents of white students often turn to public charters as an alternative to more expensive — and less diverse — private schools. In the aftermath of bitter clashes at Stoner, Zimmer has been trying to accommodate both groups though there is little he can do formally. 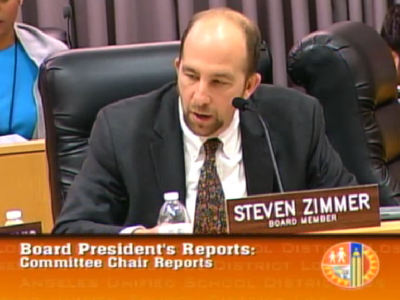 It is an issue that must be resolved by LA Unified’s charter school division and CWC. “There is an answer, it just has nothing to do with parking,” Zimmer said, referring to the initial squabble that lead to the battle between parents. For now, CWC’s future remains uncertain. It has rejected the district’s offer to move to Horace Mann Middle School and this week asked to remain at Stoner or at a school in close proximity. But the final decision depends upon negotiations between the charter and district officials. *Adds comment from the California Charter Schools Association.